Rudolf Steiner taught that, beginning in the twentieth century, Christ would reappear in the etheric (or 'life') realm of the Earth. And he made two further predictions in relation to that event: firstly that, before such a reappearance could take place, mankind 'must have passed through the encounter with the Beast, which will appear in 1933'; and secondly that, around the end of the twentieth century, 'Sorath' - the Sun Demon - would oppose people's personal vision of the etheric Christ. Taking these statements as his starting point, Tradowsky examines the question of evil and its relationship to Christ. He describes Sorath and his activities, asserting that knowledge of this elusive and terrible being helps individuals to overcome him; and he explains the role of the 'Apocalyptic Beast' in relation to Ahriman - or Antichrist - and the latter's physical incarnation on earth. 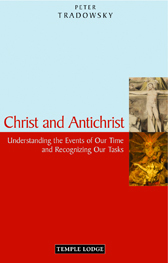 Intended for those with a close concern for anthroposophy, this book provides essential background information to understanding the events of our time and clarifying our tasks in relation to Christ, evil and the new millennium. PETER TRADOWSKY, born in Berlin in 1934, taught at the Rudolf Steiner school in Berlin and co-founded the Waldorf Teacher Training course there. He initiated the building of Rudolf Steiner Haus in Berlin in 1983, and was a key staff member of the Arbeitszentrum (Study Centre) for 21 years until 2005. He is a frequent lecturer, and the author of many books such as Christ and Antichrist and Kaspar Hauser.